Product prices and availability are accurate as of 2019-04-14 15:56:25 EDT and are subject to change. Any price and availability information displayed on http://www.amazon.com/ at the time of purchase will apply to the purchase of this product. Cat Grass (Oats) Seeds - 15 grams - Botanical Interests Annual Avena sativa It is a wonderful treat for cats, providing nutrients, and helping to eliminate fur balls 15 grams of seed Annual. Satisfy your cat's craving for greens with a safe alternative to houseplants and turfgrass (which may have harmful pesticides or herbicides on it). This variety of oats has smooth leaf blades for easy digestion and does not stick to the back of their tongue as they swallow. 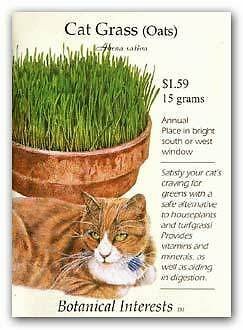 The fast-growing grass is ready for cats at 2" - 4" tall and can be grown indoors in a sunny window or under grow lights. It is a wonderful treat for cats, providing nutrients, and helping to eliminate fur balls. Cats will prefer it to your houseplants and outdoor grass that may contain pesticides. Sow anytime indoors in containers. Provide the greens for your cats for a few minutes at feeding times each day until they are conditioned to it. Then, they can have more free access.